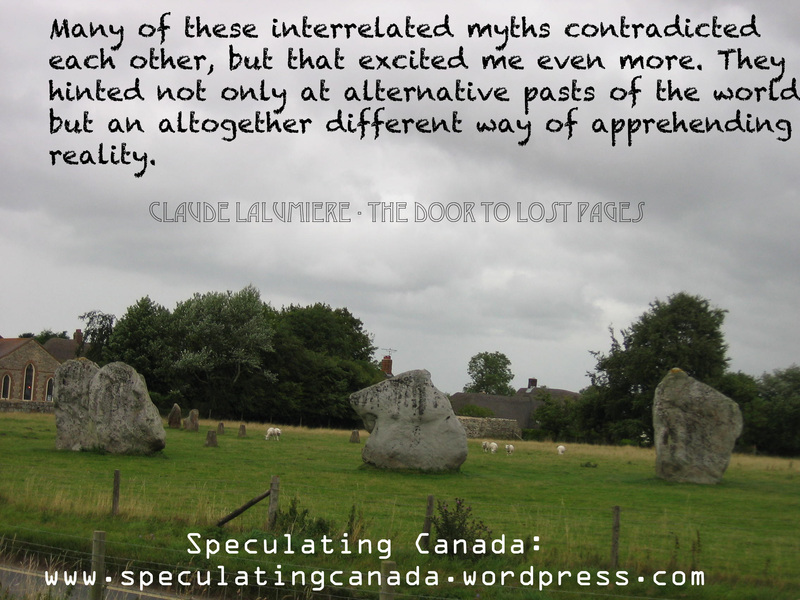 In The Door To Lost Pages, Claude Lalumiere once again shows his ability to add a hint of the mythic to the underpinnings of reality and challenge the hegemony of the real by suggesting that there is more to the world than what we deem to be real. Lalumiere creates the ideal bookstore, the one that every person who has been a social outsider dreams about, a place to escape from the humdrum world around them and find a place to belong and a place that acknowledges that reality itself may be more diverse than mainstream society accepts or portrays it to be. Lost Pages is the ideal bookstore for those who have been cast as “weird” to find themselves. It captures the ability of bookstores to create a place of escape and comfort for many of us who are social outsiders. Lost Pages is a place OF the strange and FOR the strange. It is a physical embodiment of the fringe, existing on the edge of reality and changeable, only really noticed by those who need it. Lalumiere illustrates that stories and myths themselves are places of belonging, as uncomfortable, weird, and simultaneously homey as the people who read them. The space between words is one where one can discover a place of belonging, discover one self, and be able to be comfortable and even revel in being weird, different, socially abject. 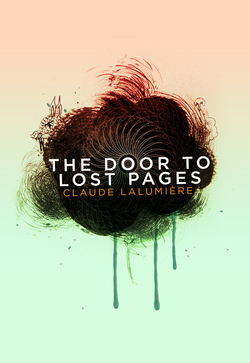 As with many of his stories, Lalumiere’s The Door To Lost Pages evokes in the reader a desire to question that reality is just what we see or make of it. He plays with intersections of multiple realities, duplicates, changeable worlds, and diversity of perception. He acknowledges that for a world of diverse people, the way we see the world, the way we define reality, is itself diverse, multiple, and changeable. We do live in a world of multiple realities and every person has their own reality, their own way of viewing the world and we neither can nor do see what others see, but we need to learn to try. Claude Lalumiere evokes the dreaming mind, the subconscious, unconscious, superconscious, and the semi-permeable barrier between dream and reality becomes the space between one page and the next. You can read more about Claude Lalumiere at his website at http://lostmyths.net/claude/ . To explore The Door To Lost Pages, you can visit ChiZine Publications’ website at http://chizinepub.com/ . The world has changed. Humans have been forced off of the planet Earth by their supposed ‘saviours’, the Eosians. Humans were threatened by a race called the Vos, a race that desired the destruction of humanity, but the Eosians drove them away… only they decided not to leave. They claimed origin from the Earth, claimed that they were the alien hybrids of humanity and the Eosian gods, the Epoptes. They have appointed themselves the Guardians of the galaxy, in charge of maintaining their own ideas of law. In her Outer Diverse, Nina Munteanu creates a human future on the edge of chaos, and a multiverse that flows back and forth, one universe feeding into another. Religion and science are not entirely separate in this world as ideas of the spiritual and the rational interact with each other. Nina Munteanu illustrates her love of diverse ecosystems, richly describing complex alien eco-webs. Rich descriptions of biodiversity populate her narrative, making the alien environment feel real, feel close, and engage the senses. She evokes in the reader a desire for exploring the miraculous diversity of life. Often SF focuses on physics and related sciences, creating detailed descriptions of space-warping abilities and the technologies of the future, but Munteanu reminds the reader of the importance of exploring the biological sciences in SF, exploring the richness of alien environments, the relationships between diverse organisms, and technologies that incorporate the organic and principles of biology. Nina creates aliens that make sense in ecosystems that fit with them. Munteanu’s narrative focuses on a woman who identifies as human but discovers that her body contains a richness of diversity, skills beyond human ability and often beyond her control. She is the only non-Eosian allowed to be a Guardian, a police officer of the future with a mission toward preserving galactic order and security and preventing criminal activities. Despite working with Eosians, she harbours racist notions about them, fearing them and viewing them as a threat to humanity. She is an insular character, fearing dependency on others and the loss of her own independence. She is fundamentally unwilling to let her guard down, to see herself as needing others and afraid that trust may weaken her. It is ironic that her final willingness to trust another who eventually takes advantage of her encourages her to make networks of friends, to learn to rely on others and accept them rather than spurring her into further insularity. You can explore Nina Munteanu further at her website: http://www.ninamunteanu.com/ . Werewolves and witchcraft meet alternative worlds in Noah Chinn’s Bleeding Heart Yard: A Damned Love Story. Chinn explores the pervasive power of myths and myth-building, looking at how places come to be associated with mythical explanations, the way children will create urban myths to explain spooky occurrences, and how games and stories can engage in mythologising. The dichotomy between real and fiction is challenged, puncturing the boundary between the physical and the mythic and putting the reader in a space between the urban world and the fantastic. For the first time in his life, Peter is able to hit a home run, right through the local witch’s window. Curse and blessing play together as Peter finds a lifetime friendship with the witch’s son despite acquiring a lifetime curse from the witch herself. The key to true cursing pain is to mix blessing and curse, which is why Peter is cursed to be able to find his true love but to only be able to speak to her in swear words. The mixture of curse and blessing define this world – everything is a mixed blessing for the characters – want to believe in the magical world? Excellent, meet a werewolf that wants to kill you. A werewolf finds a passage through into this world, a virtual buffet of unprepared populace – a world without magic and without defenses. But, this world is not as it seems, there is a strange figure in the sky, a white circle that disrupts his ability to maintain the shape of his prey and forces him back into his natural shape. Now, all he wants is to get home. Noah Chinn plays with boundaries: the boundaries between worlds, between curse and blessing, between myth and reality. Bleeding Heart Yard: A Damned Love Story forms a liminal place, an ambiguous and shadowy place where characters are forced to face aspects of themselves they would like to keep hidden and come to terms with ideas of home and family that don’t always meet their expectations. A Review of D D Barant’s Death Blows (St. Martin’s Paperbacks, 2010). 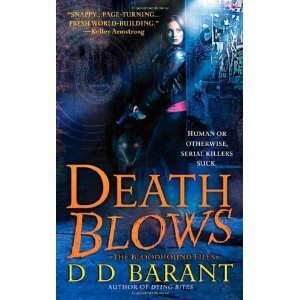 Death Blows will be the second of DD Barant’s The Bloodhound Files novels that I will have reviewed. You can check out the review of book one by clicking on DD Barant in the Tags section. In a world where everyone has supernatural powers, there are no need for comic book superheroes, so why does a man get murdered wearing a Flash costume… the costume of a superheroic figure from our world? Like the world of comic books itself, full of multiple realities, crossovers, dimensions colliding with one another, the comic BOOK itself becomes a vessel for taping into other realities, it becomes a conduit for crossing the dimensional barrier. Barant’s world, dubbed Thropirelem because it is made up primarily of (lycan)thropes, (vam)pires, and (go)lems is one that recognises the power of the comic book. It is a world of magic that looked at the comic book and saw a medium that combined pictures, words, concepts of multiple worlds, and mass production and realised what this could do. When a comic book cult formed to use the power of the written word and inscribed image to change the face of reality, the population of Thropirelem could see the danger – True Crime Comics could become comics that were foretelling crimes that would soon come true. As conduits for dangerous magic that could shift the mentality of all of their readers, comics were seen as a danger to society and banned. So when murders begin happening in Thropirelem that have allusions to comic books, who do they call in but Jace Valchek, a human FBI forensic psychologist from our world who has been brought over to Thropirelem to find a serial killer. She may not have a lot of experience with comics, but she at least comes from a world where they aren’t illegal and where the figure of the superhero has permeated popular culture. Plus, her background working with people with mental illness means that she can grasp the nuances of a mind that would use comic books as a method of murder. Through the course of her investigations, Jace discovers a secret that the government has kept hidden, that comic books had been used as a counter-weapon against the comic cult and that even supernaturals need superheroes. But these superheroes, now having retired their super-powered weapons and hung up their tights, are now under attack and each of the murders is charged with comic and cosmic significance. Comic books are the ultimate interface between the imaginary and reality, creating an imaginary world on the page – penning and inking it into existence. They are the perfect point of obsession for the deranged mind of a killer who intermixes reality and the imaginary and can’t distinguish between the two of them. Barant’s interplay between ideas of reality and imagination and the power of the written medium as a communication tool and point of connection evokes in the reader a curiosity about the nature of the university and the possibility of multiverses. Barant’s discussion of the power of the comic reveals an interest in the persuasive influence of popular culture, and the ability of the written medium to create change. What we write about DOES have an influence on the world, though perhaps not so directly as the comic medium in Thropirelem.